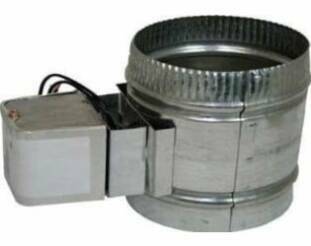 Motorized Electric Zone Dampers made of thick quality steel, with air tight seal, high quality Erie Motor, and a crimped end. Commonly used in zone systems for commercial and residential applications. Also for controlled exhaust and other HVAC air flow management. Luxury Metals motorized HVAC dampers are offered with spring return, power open and power close models. When powered, the zone damper will do the opposite of its ambient position. Our motorized dampers have a 24 volt or 120 volt motor option. The damper is built with a heavy galvanized round duct casing and aluminum blades which provides light weight with maximum strength. The motors are high torque and manufactured by Erie, a trusted motor brand. The damper design provides smooth operation and efficient energy efficient sealing.